Blogging about all things fun and exciting! Imagine a world where you own a car, wash the car, but don’t drive the car. Don’t conceptualize too hard, this seemingly outlandish idea may soon become the go-to method of transportation. As our technological world advances, feats that were formerly impossible have suddenly become ‘just a matter of time’. While there may be skeptics and naysayers who are not in favor of hopping in the passenger’s seat, allow me to further explain the advantages of driving without actually driving. Firstly, think of the floodgates this would open up to disadvantaged members of our society who do not currently have the privilege of being drivers. This includes individuals with physical or mental ailments and the elderly who no longer have the ability to drive. What a marvel this would be to these groups. A driver-less car would promote independence, safety and heightened quality of life. The phrase ‘I won’t believe it ’till I see it’ has legitimacy here. Knowing this, Google implemented a couple sure-fire methods to get lawmakers to understand the marvel that is the driver-less car. 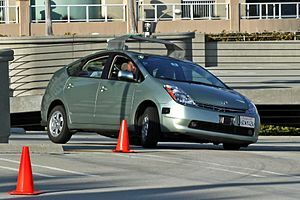 Google presented video evidence of the car immediately stopping when sensing pedestrians walking in front of the car. Ms. Dondero Loop, of the Nevada Transportation committee, said of the video ‘That was an ‘aha’ moment for me’. Certainly they were impressed, after all this is a car that does not text, eat, drink or put on make-up while driving! What this technology means is zero distractions, all focus for the Google car. As a follow-up Google allowed lawmakers to ride along in the car to be amazed first-hand and in a live environment. While this car is certainly a threat to cab-drivers, we can see the real potential and realism of the driver-less car. Google has proven skeptics wrong numerous times and have the statistics to back it up. I certainly could not argue against my car driving me home safely after an evening of adult beverages with friends. While this use can be seen as a luxury and not a necessity it does have more more profound uses, as mentioned earlier. Yes, it will take time for these cars to do a complete overhaul on the automotive market but I do believe this will become a widely accepted practice in the future. Humanity has taken small steps toward this phenomenon in years past, such as auto-pilot (yes, very small steps). As with all new cars, including electric hybrid, the initial hurdle will certainly be price, with only the most fortunate of individuals riding shotgun first. There will be challenges before wide-spread implementation and this is common, given the radical change to transportation. I for one can not wait for my car to take me on road-trips across Canada while I catch up on a good book! This entry was posted in Uncategorized on June 27, 2013 by shawnbell4. ← No Privacy Settings? I also like to live dangerously.